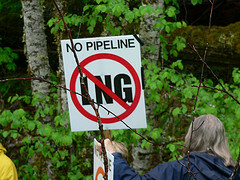 ← Photos from No Enbridge NO!SE DEMO! The exploitation of ever more difficult, expensive and harmful fossil fuel sources demonstrates the greed and insanity of the present global economic system. Decades ago it was possible to debate when Climate Change would occur, how fast and how seriously we would experience its impact. Now the world is experiencing its effects – most dramatically the poorer and marginalized people for whom the line between bare survival and death from flood, drought and famine is so thin. The question we face now is whether we can reverse course before the climate crisis spirals out of control into a catastrophic environmental collapse. Tar Sands expansion in Alberta and the related pipeline proposals through un-ceded First Nations territories to the BC coast are prominent in public debate. Equally significant but less well known is the rapid expansion of shale gas fracking in North Eastern British Columbia. Technological advances and corporate driven politics have made possible a type of fracking currently underway that is unprecedented in scale and environmental cost. This is part of an escalating trend within BC and across North America to expand growth within the oil and gas industry at the same moment that we are gaining greater awareness of the implications of greenhouse gases and the need to grow community resistance to climate change. On February 25th and 26th the BC government will hold an international conference on liquefied natural gas (LNG) at the Vancouver convention center. The conference aims to promote fracked shale gas to a global market and is a significant step in the government’s goal of having three LNG facilities operating by 2020. Millions of gallons of water combined with hundreds of chemicals are pressurized using up to 40,000 units of horse power and then injected into wellbores two miles deep. These then angle horizontally another kilometer underground. The pressure this creates fractures rock formations which increases extraction of shale gas. Along with using and poisoning huge amounts of surface and ground water, this process results in a lifetime 5%-7% methane leakage. Methane traps heat more easily than CO2 and is the second largest contributing gas to climate change. It is 105 times more potent than CO2 over a 20 year period meaning even a short term release of methane can be more damaging than CO2 emissions. Horizontal wells of the type being used in BC tend to leak the most, and have leakage rates increasing to 30% to 50% as wells age. The three purposed LNG plants on the BC coast would convert shale gas into a liquid that could be piped into tanker ships which must then navigate the precarious Douglas Channel. The process of liquefying shale gas is incredibly energy intensive and must be powered by either hydro electric energy or the shale gas itself. A 2010 BC hydro analysis found the prospect of an eight-fold increase in power demand by the province’s oil and gas industry – if the shale gas industry expands as it is projected to do, it will need the equivalent of more than two Site C dams’ worth of power – meaning shale gas development will impact the decision on whether to build the Site C dam on the Peace river. At a time when we need to conserve and maximize the benefit of relatively green hydro power as we transition to a sustainable society, the projected expansion of fracking in the Peace River region and construction of LNG plants on the coast will devour huge amounts of electricity. It is not possible to exaggerate the insanity of using limited “clean” hydroelectricity resources to extract dirty fossil fuel for export. The purposed LNG plant in Kitimat depends on shale gas from the planned Chevron Pacific Trails fracking gas pipeline from which up to forty per cent of the gas piped could be used in powering the LNG plants. Further, clear-cutting for PTP increases the accessibility for Enbridge to build along the shared route. Chevron, Enbridge and PTP do not exist in a vacuum. We need to resist these as a whole, acknowledging the carbon corridor that industry with the help of our own government are pushing for as they ignore the realities of climate change and environmental and community destruction. Anthony Ingraffea is a scientist who has been studying fracking for decades and is one of the world’s foremost experts on hydraulic fracking. A recent study headed by Ingraffea at Cornell University found that when the full effects of shale gas fracking are taken into account, especially methane leakage, “the footprint for shale gas is greater than that for conventional gas or oil when viewed on any time horizon, but particularly so over 20 years” and that “compared to coal the footprint of shale gas is at least 20% greater.” When we consider the massive use and poisoning of water that thousands of rural residents rely on, the greenhouse gas emissions resulting from extraction, and the energy intensive process of liquefying shale gas, we see how mind-boggling this process is in its defiance of responsible stewardship of the earth. For all these reasons, and more, there is a growing movement in opposition to fracking in BC and across North America. In BC First Nations are on the front-line of this struggle as the developments are taking place on and through their un-ceded traditional territories. The Fort Nelson First Nation, along with their neighbours and allies in the farming communities of the Peace River region, face the brunt of the immediate environmental threats and have taken the lead in raising the alarm over the threat in their area. The Unis’tot’en clan of the Wet’suwet’en Nation have for over a year maintained a blockade of the planned Chevron Pacific Trails fracking gas pipeline route to proposed LNG plants at Kitimat as it passes through their territory near the Morice River. They are committed to blocking all the pipelines – whether for tar sands bitumen or fracked gas – from passing through their territory in order to protect not just their territory but Mother Earth and the global climate. This Rising Tide collective pledges its support to these front-line communities and urges other people of conscience to join with us in supporting the movement to stop fracking and begin the process of healing the earth and creating a future for our children – for the next seven generations and beyond. We condemn the LNG conference happening in Vancouver on February 25th and 26th for what it is: a reckless corporate party whose goals of massively expanding shale gas extraction in BC are a danger to survival.